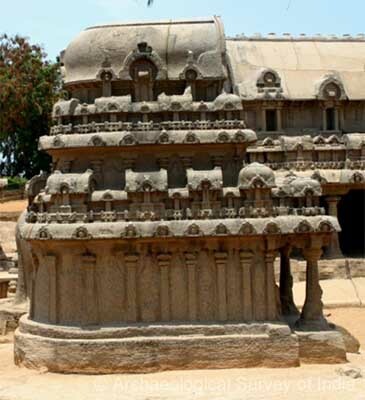 There are about nine monolithic temples at Mahabalipuram. 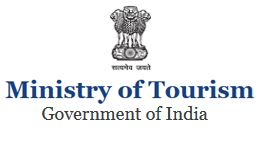 They are the unique contribution of the Pallavas to Indian Art. 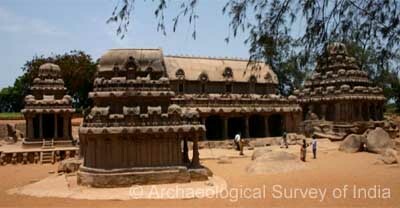 The monolithic temples are called locally as Ratha (Chariot) as they resemble the processional chariots of a temple. The Five rathas, the best of all monolithic temples, are hewn out of a huge boulder. Temples of different plan and elevation have been carved and the left over portions were intelligently used to carve animals in a natural way. The naming of these ratha, after Pandavas and their wife, the heroes of epic Mahabharata, is simply a local tradition. 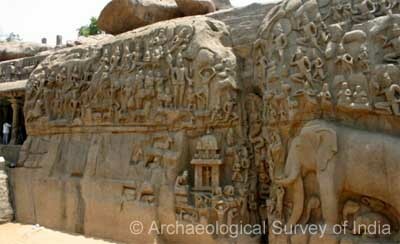 Among the Five rathas, Dharmaraja ratha is the most impressive and sculpturally rich. The tritala (three storeyed) vimana, square in its talas but octagonal in the griva sikhara region, faces west.The sculptures around the sanctum in the corner blocks depict simple forms of Siva, Harihara, Brahma-Sasta, Brahma, a delicately balanced representation of Ardhanarisvara besides a portrait of a king, possibly Narasimhavarman I himself above which his titles Sri Megha and Trailokiya –vardhana-vidhi are inscribed. The upper floors, a veritable gallery of images, have excellently modelled images of Siva as Gangadara, the earliest representation of Siva as Natesa in the Tamil country, Vrishbantika, Kankalamurti, Vishnu resting on Garuda, and Kaliyamardhana. An inscription gives the name of the sanctum in the uppermost tier as Atyantakama Pallavesvaram, Atyantakama being a title of Paramesvaravarman I. 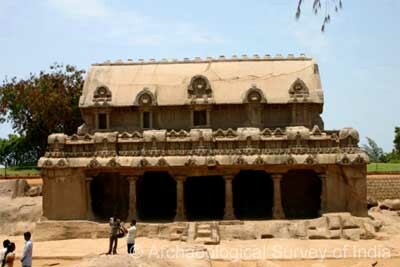 This monolithic ratha is oblong in plan and having an ekatala vimana possibly intended to be dedicated to the reclining form of Vishnu. Only the impressive Sala -Sikhara is fully finished and there is a hara above the ground storey and has high griva wall. The Sala roof carries bold nasikas to carry a row of Stupis and Astradeva trident-finials at the apexes of gable ends. The gable ends is brilliantly relieved with decorative motifs and at the centre is a miniature model of a square, ekatala shrine with circular and crowning stupi. 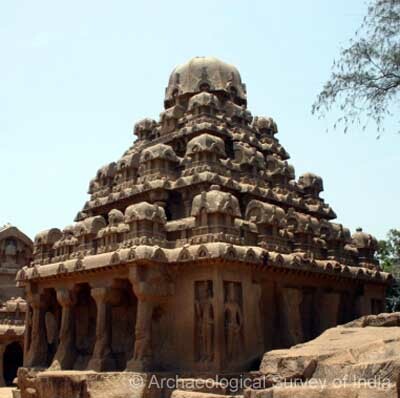 This monolithic Vimana is one among five that carved out of a live rock. 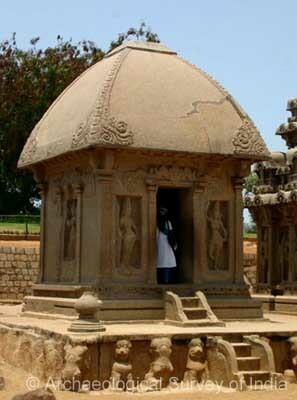 This small dvi-tala (two tiered) vimana consists, on plan a garbhagriha with a pillared Mukhamandapa. 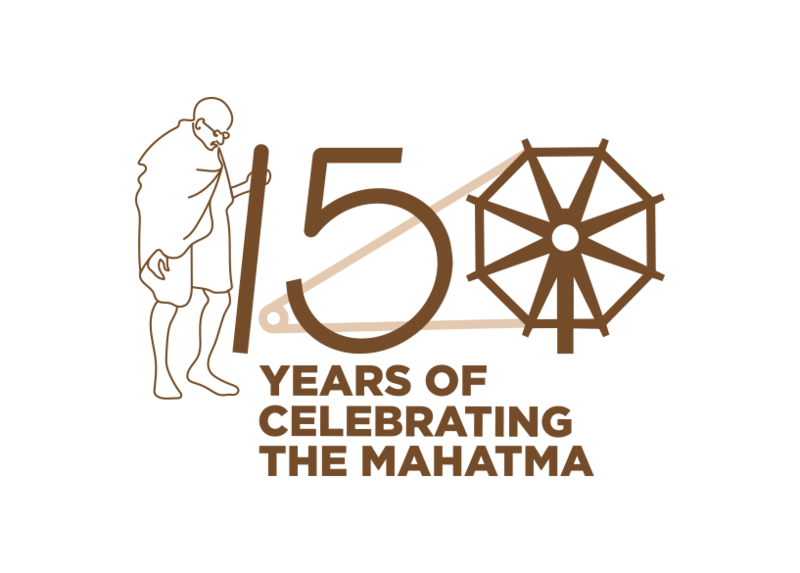 It shares an Upa Pitha with Draupathi ratha. The adhisthana is of simple Padabandha type. The pada portion has slit-niches between elegantly carved pillars carrying very handsome figures of Parthiharas, Amaras, a Siddha, a Chowri bearer, apsaras, and various deities like Vishnu, Skanda on elephant and Siva-Vrishabhantika. The upper tala (Storey) carries a hara with octagonal sikhara. There is a stupi carved out of the live rock but not detached from it, possibly to crown the Sikhara of the Vimana. This is the smallest and the northern most of five monolithic rathas. 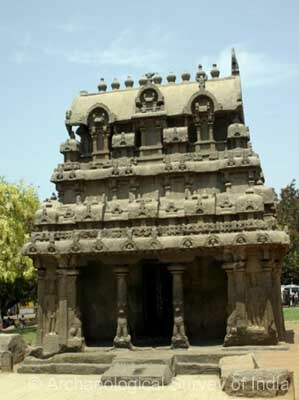 It illustrates a simple hut-like Kutagara-Vimana. It shares an upapitha with Arjuna ratha. In elevation, the vimana has a simple padabandha adhisthana. The pada portion has devakoshtas containing images of Durga. The usual kapota is not to be seen. The roof, shaped like a hut with decorative motif in the joints. There is stupi carved out of the bedrock in a corner of the upapitha but yet to be detached from it. The sanctum bears an excellent depiction of Durga, possibly of later period. This monolithic ratha has an apsidal (Gajapriishta) plan from base to sikhara, recalling the earlier chaitya models. It is carried out of an independent boulder, stands near the Arjuna ratha and faces south. It has a dvitala vimana (two storeyed). The adhistana of this vimana is not defined. The pada is simple punctuated by pilasters. There is a mukha- mandapa in the front. 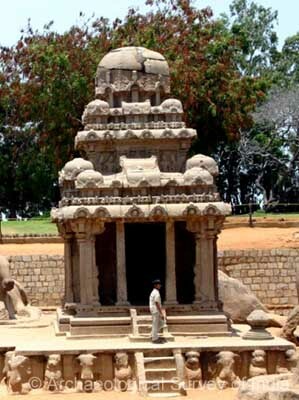 The other monolithic temples worth mentioning are Ganesha ratha and Pidari ratha. Arjuna’s penance is an impressive bas-relief, datable to Narasimhavarman I’s period, suggestively depicts the story of Kiratarjuniya, wherein Arjuna, the great warrior hero of the Mahabharata, obtained the all-pervading Pasupatha weapon from Siva after a gruelling fight and severe penance. Siva and an emaciated Arjuna, doing penance, are shown prominently at the centre. The artist has excelled in imagination by placing the scene by the side of a river, judiciously suggesting the natural cleft as a river by depicting a naga and nagini. The peace and calm of the situation further enhanced by the presence of Chandra, Surya, Kinnaras, Ghandarvas, Apsaras etc., hunters carrying the hunt, host of animals, sages doing penance in front of a temple and Brahmins doing the mid-day rituals. The deer resting at ease by the side of a lion and the rats frolicking around the wily cat doing penance on hind legs have only enhances the mood. Depicting the animals in the most natural form and in right proportion is a testimony to the skilful execution by the artist. 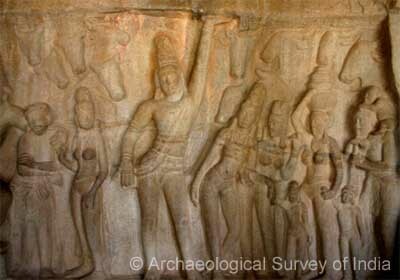 The huge bas-relief with a hall (mandapa) of 16th century added in front depicts the story of Krishna lifting the Govardhana hill to protect the cowherds and the cattle from the storm raised by Indra. The central figure of Krishna, with Balarama by his side, is shown lifting the hill with his little finger. Enjoying the divine protection, the rest are carrying on their business as usual. The artist suggests this by depicting a gopa (cowherd) milking a cow while the cow itself is fondly licking its calf. Another cowherd is seen playing a flute while the gopis carry a pile of pots. A woodcutter strolls with an axe. While one child enjoys the warmth of her mother, another takes a ride over the shoulder of an old man. The hill itself is a habitat for lions, griffins and sphinxes. This is the best representation of this story in the art of India.